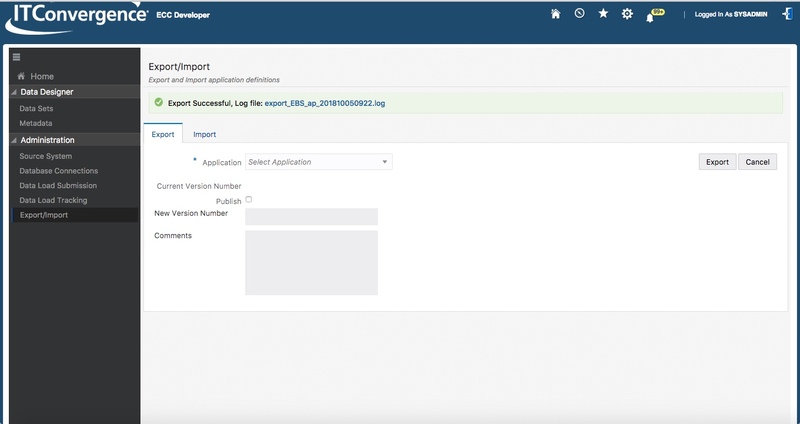 A few days ago, we received the good news from the Oracle E-Business Suite team, announcing the availability of Enterprise Command Centers for EBS, also known as ECC for short among a series of innovations including the new release 12.2.8. I was interested in this new product since the first time that I heard about it at Muhannad Obeidat presentation back at Collaborate 2018. I had quite some experience implementing Endeca Extensions for EBS (also called Information Discovery for EBS) which was somehow expensive and in certain customers fairly complex to make it to work. After multiple conversations about the product with Muhannad, Jeanne Lowell, and Nadia Bendjedou, I was impressed with the vision, the changes on the technology compared to Endeca and I was even more shocked hearing that they will be “unlocking the value of enterprise data” without any licensing costs. Yes, it is a product that will be free for E-Business Suite customers running release 12.2.4 and above. 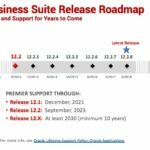 On September 28th, the Oracle Enterprise Command Center Framework Release 12.2 V1 Quick Install for Linux x86-64 was made general available on My Oracle Support as Patch 28574967. 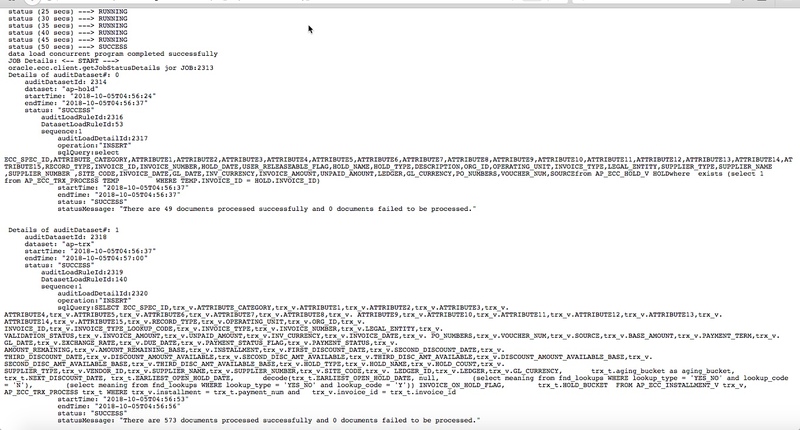 A detailed instruction document for installing the Oracle Enterprise Command Center Framework was uploaded into MOS in the Doc ID 2409163.1. In an informal conversation with our head of finance, I mentioned the possible announcement of this product a few weeks before GA, and his first reaction was asking: “Why another reporting tool?”. It is an awful truth that IT departments over the last few years have explored many reporting tools on different technologies and we’re still doing it. But this is different, and bear with me on this blog to learn why I think this is not just another “reporting tool”. The vision of ECC is to add visibility and optimize the work of E-Business Suite users by enhancing the way they work and accelerating their day-to-day activities. I would think ECC as a starting dashboard with the right information to take action and go straight to the documents or transactions. The rich graph and easy use of refinements -filters, and a powerful search. 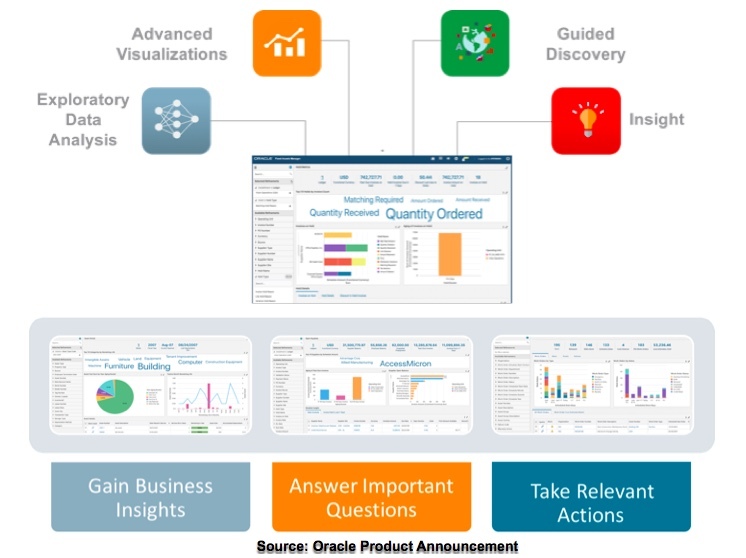 But why don’t you take a look into the details on how to get it to work and if you still have questions don’t miss our session [PRO4227] Empowering the Oracle E-Business Suite User Experience: Technical Details/Implementation at Oracle OpenWorld 2018 (Thursday, Oct 25, 12:00 p.m. – 12:45 p.m. – Moscone South – Room 104). Now let me share our experience implementing ECC at IT Convergence and the feedback from our users which can help you to start thinking on getting this to work at your organization. You can use the existing server for Apps as part of the installation for ECC but it is recommended a new server and that’s what we did. We built a Virtual Server with 8vCPU, 32 Gb of RAM and a 100 Gb of storage. When we started the deployment of the application the infrastructure team named the new server for ECC with more than 30 characters and we did not notice that until the creation of entries in the FND_NODES failed. Yes, this is something that it is enforced across the board by FND but you need to consider at the time you’re requesting a server to the infrastructure team to avoid back and forth. In terms of specifications for the server side, there’s a quick table for sizing the cores and required memory at the MOS note. You need a minimum of 2 cores, 32 Gb of memory and 80Gb of storage. As your E-Business Suite has more users and more records, you would have to scale your cores and memory up to 4 Cores and 4 Gb of memory top. Our instance is release 12.2.6 so we applied the container patch 28045200:R12.ATG_PF.C (ATG Consolidated Patch for ECC V1 support in 12.2). After that we applied the following patches 28050532:R12.FIN_PF.C (FIN Consolidated Patch for ECC – V1) and 28574967 (Upload for ECC QI). One more thing, before starting this process we had to upgrade the database to 11.2.0.4 as part of the pre-requisites. Make sure you have that release or higher before starting. Once all the patches were applied and ECC installed, you need to make sure the EccConfig.properties file has the appropriate parameters for your EBS environment, which is done during installation time as you follow the install instructions. The first test you have to make is at http://<ECC_HOST_NAME>:<ECC_ADMIN_PORT>/console where you’re going to be able to setup the source. Remember you only need to test from here but otherwise the installation will create the source db connection during install process. You will select ebsdb, test and move to the next step which will be the integration between ECC and E-Business Suite running the envSetup.sh script, and when prompted, select option 5, Integrate With EBS. 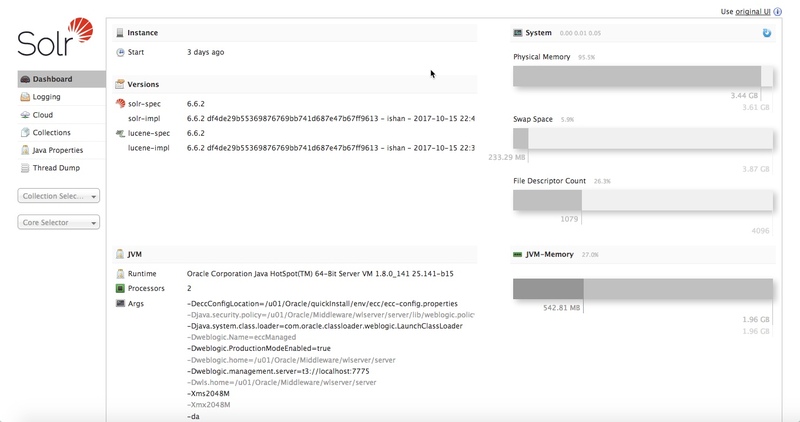 The last part of the installation is the application of patches to updated Oracle E-Business Suite artifacts to the Oracle Enterprise Command Center Framework. 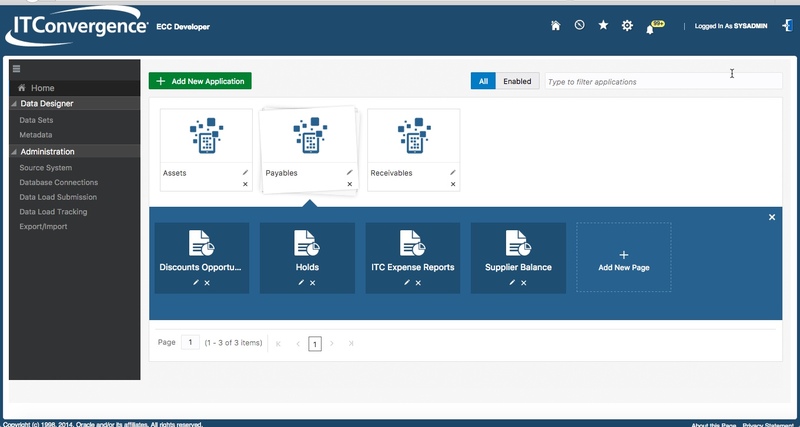 Enterprise Command Center comes for a series of modules and right now it is available for Fixed Assets, Account Receivables, Account Payables, Asset Management, Order Management and Inventory Management and for each module there’s new concurrent program to load its product-specific data. The first time (or maybe more in the future depending on changes you’ll do) you will be running a full load. 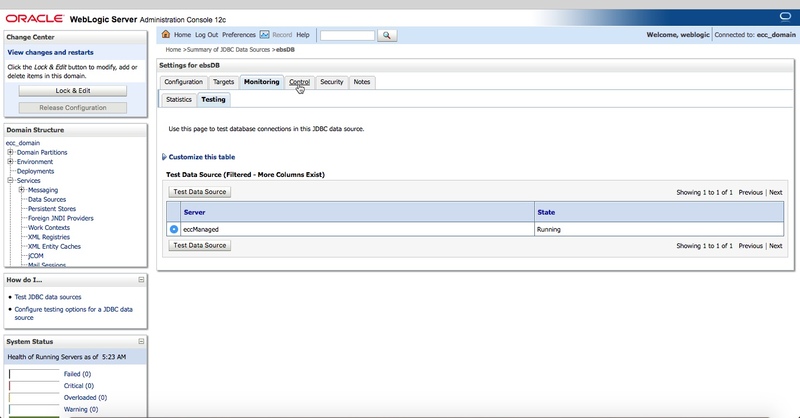 For example, as shown in the picture, the “Payables Command Center Data Load” has 3 parameters. 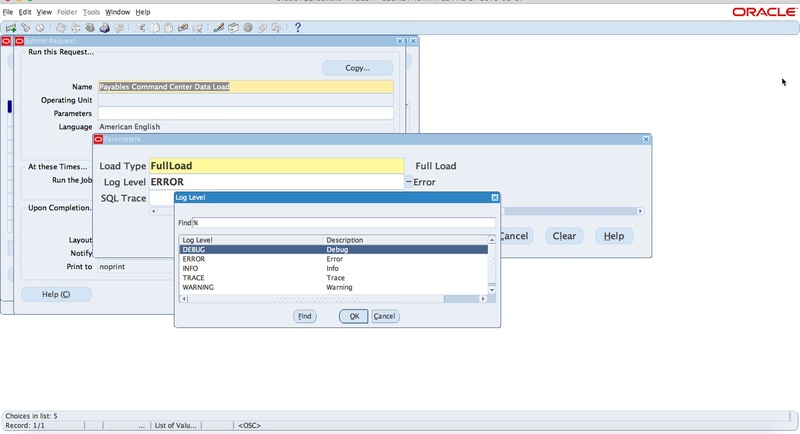 The Load Type Parameter you can select between a “FullLoad” or “IncrementalLoad” and the Log Level as shown in the Picture. This concurrent program will trigger another concurrent called “ECC Run Data Load” which will be running the different data sets (which I will explain later). 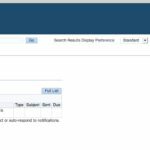 You can view the Log of this concurrent request which will display the sqls as well as status message of how many documents were processed successfully or failed. Once you have completed this load there are some System Administrator’s activities that need to be perform in order to enable the users and also the ECC Developer. The Enterprise Command Center pages and regions as well as the ECC Administrator and ECC Developer responsibilities are not included in the standard shipped responsibilities. 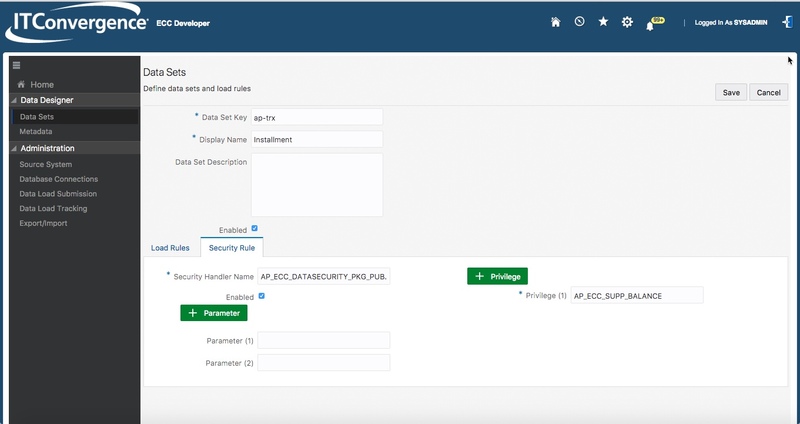 ECC have created Oracle User Management roles and permission sets to provide access to these Enterprise Command Center pages and regions through role based access control (RBAC). 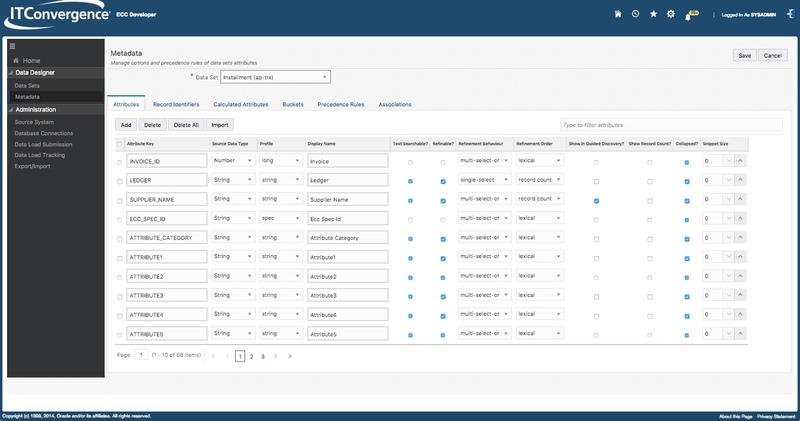 You can have the flexibility to control who has access to Enterprise Command Center pages and regions by adding the new product-specific roles to responsibilities, to other roles, or directly to individual users. 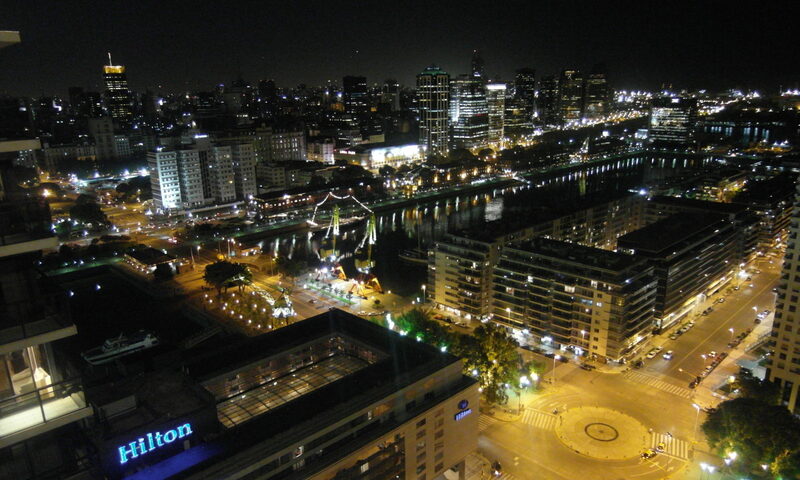 And we assigned them to some standard and custom responsibilities we have assigned to our users. If you have to assign many, there’s a script UMX_ENDECA_RBACAuto.sh that with a simple .csv file will make your life easier. These two new responsibilities will help to run, monitor, and tailor Enterprise Command Center. The “Schedule Function”, which is the only one new in there, allows you to define the periodicity on which you’ll be running the “ECC Run Data Load”. I have not used it here since you can run the concurrent requests from your System Administrator responsibility as described above but it is handy based on your segregation of duties. The other new responsibility is “ECC Developer” and there are a few new concepts in here. The home screen has all the applications, which right now on version 1 is just 3 (Assets, Payables and Receivables) because we applied the Financials container patch and you can add more later on. If we have to define the concept of an application, I would say that, it is a group of “Data Sets” and “Pages”. The “Data Sets” will be defined by “data”, basically a SQL, that will be pulling rows from E-Business Suite which is included in a given Package and procedure. 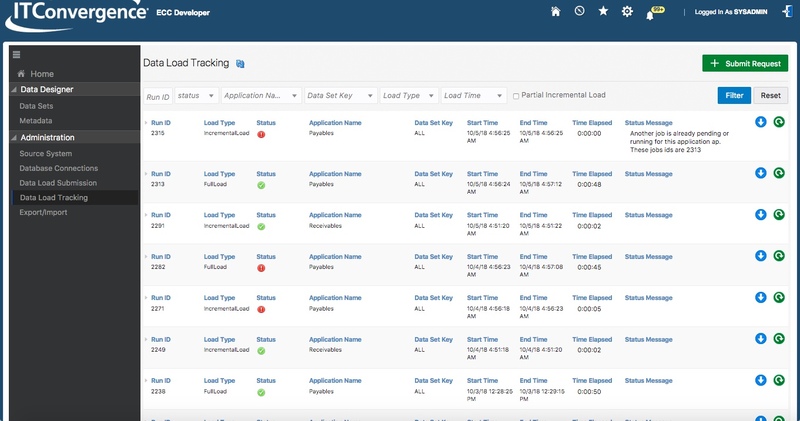 For example: there is a data set called “ap-trx” that comes with the tool out-of-the-box and have a defined load type for metadata load, incremental load and for full load. As you can see in the picture, this is called through a Package (AP_ECC_UTIL_PVT) and a procedure name (GET_ECC_DATA_LOAD_INFO). On a second tab, you’ll select the security rule which will be taken from the standard security rules that you have on EBS for your users. The security handler is based on a package called “AP_ECC_DATASECURITY_PKG_PUB” and the function “GetFilterAttributeValues”. Once you have pulled the data set you can define the metadata which are the details of it. ¬You’ll be able to add the different attributes (or columns from your data set) and different characteristics of it. The definition is important because it will drive the behavior in ECC of that field, for instance if it would be searchable or how the refinement -which is how ECC calls the parameters- will be displayed. You can also add “Calculated Attributes” with operators. We can see a few examples for “Past Due” as well as a “Percentage Calculation” in the picture below. There is an option of adding buckets, such as the discount buckets determining the start and end of each bucket. Finally at the data set setup, there is a definition of the associations, which is basically how the data will be connected through the different sources and will allow to drill through. 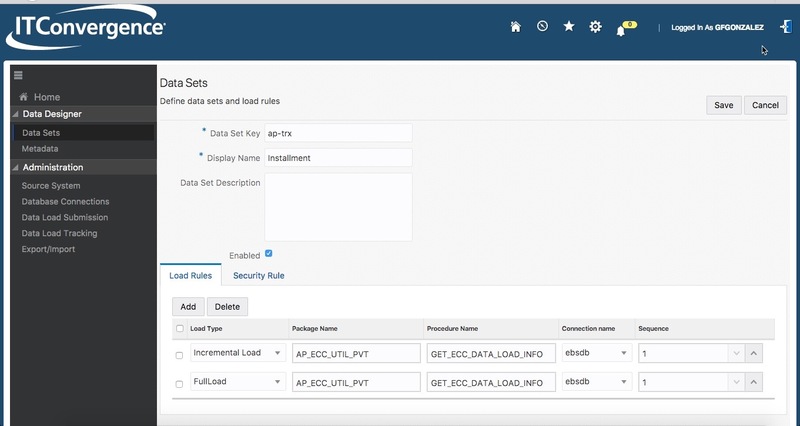 Within this “ECC Developer Responsibility”, you can execute a submission of a Data Load as well as monitor and track the Data Load in the “Data Load Tracking” option. The last option of the menu is an Export/Import functionality which I think will be very handy for moving Applications from one environment to another as well as sharing within the community since this product is free and open for E-Business Suite users. How easy is to add a new field to ECC? We’ll explain later on how easy is to create a new KPI or view in ECC from a user’s perspective, but as usual we will have users that will request for new fields that are not in the existing data sets. If that’s the case, then you’ll have to have some PL/sql skills in order to add a field into the datasets. For example, if you want to add the Payables Invoice Description (field AP_INVOICES_ALL.DESCRIPTION), you’ll have to open the package AP_ECC_UTIL_PVT and modify the procedure GET_ECC_DATA_LOAD_INFO. Inside the procedure there’s a query of the new view AP_ECC_INSTALLMENTS. You’ll add in the select of that view the column “ai.description” and you’ll go all the way up to make sure the package compiles correctly and you’re not changing the granularity of the results. This is very important when modifying the source. Once you’ve done so, you’ll go to the ECC Developer responsibility and refresh the fields and add the additional column by copy and paste the column name to the attribute field adding the details that you’d like to have there for the ECC tool. Want to see how the user looks like? I’ve another post, where I explain in detail the user perspective as well as how the users can tailor the pre-built content. 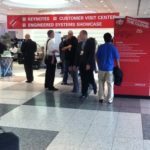 • Empowering the Oracle E-Business Suite User Experience: Technical Details/Implementation on Thursday, Oct 25, 12:00 pm – 12:45 pm at Moscone South – Room 104. El día de la internet segura, qué es y por qué tenemos que promoverlo? No tengo estrategia de sistemas. ¿Qué me estoy perdiendo?